The Neshaminy High School Soccer team trained with NAC Parisi Speed School coach, Sean Hall. The training program included speed training 2 days a week and 1 day per week of strength training. The duration of the program was 10 weeks long, for a total of 30 sessions. Everything done was designed to make them more efficient athletes on the field of play specifically, acceleration and change of direction work on the turf and explosive strength training to help the athlete's burst on the field. 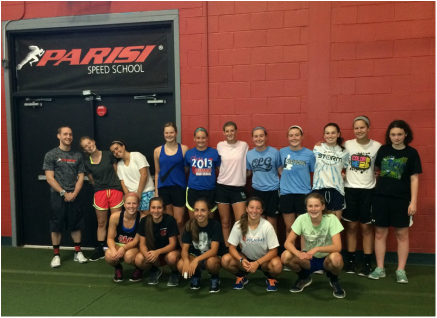 Why did you choose Parisi Speed School to train your team? As I would walk through the gym to workout, I couldn’t help but stop and watch a little bit of the training sessions that were being held on the turf. I am very familiar with sports training, but the type of training I was watching was something different. The trainers are so passionate and committed to making sure that their athletes get the most out of their workouts. I knew this type of program would be perfect for my high school girls. What do you think makes Parisi Speed School different than other team training options in the area? Like I mentioned above, a lot of other programs aren’t fully committed to each and every athlete. With Parisi, even though it’s a team workout, each athlete is given individual attention. Also, I like that the athletes are given a base-line test before the program starts and then they are tested at the end. This gives the girls a sense of accomplishment because they can see the actual numbers. What benefits have you seen in your individual athletes or as a team overall? I see a huge improvement in skill, speed, and strength. Most importantly, I see more confidence in all of my athletes that completed this 10-week program with Sean. The girls seem more committed to getting better not only for themselves, but also for their teammates. As a coach, you can’t ask for anything better! Any additional comments about your experience with Parisi Speed School Team Training or our individual coaches? My athletes love working with Sean Hall. His passion and knowledge for what he does truly shows in each and every training session. As our fall season quickly approaches, we are excited to stick with the program through in-season workouts with him!